The cost of heating your home is always on the rise. The last thing anyone needs it to have all that expensive heat escape. We often hear parents say close the door I’m not heating the neighborhood. The same can be said of the garage door. By making sure your garage door completely seals you can lower your energy bill and help keep rodents and other unwanted vermin out. Start with a visual examination while your door is up. Exam the concrete as well as the bottom door seal. Is the concrete sunk in or lifted in any area? Is the bottom door seal brittle, torn or worn out? Next stand on the inside and close the door. When it’s closed can you see light coming in from any of the sides? Can you feel a draft? If you said yes to any of these you may have heat and cold hard cash escaping. There are many types of weather stripping available. We’ll take a look at how well your door seals to the ground. Buckling and/or lifting of concrete is a normal occurrence, however often cause the door not to fully seal. 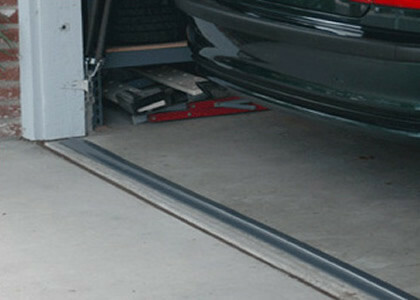 Often replacing the concrete isn’t an option so we can make an easy repair by installing the garage door seal such as the Tsunami garage door threshold seal. Seals like this adhere to the concrete not the door. This is an excellent option since they are flexible enough to contour to the existing concrete and works with the current seal on the bottom of the door. Often this door seal will take care of any openings from under the door. If you do notice a draft or light your next step would be to replace the collapsible U shaped door seal on the bottom of the garage door. These seals are often come in door seal kits such as the ProSeal and include the track and screws. If you have light or a draft coming in from the sides or top of the garage door you can apply weather stripping there as well. While individual pieces of weather stripping for sides and top can be purchased we recommend the ProSeal garage kit. The weather stripping is available in one large piece that is trimmed to fit the door, is available in 1 or 2 car garage doors kits and comes with nails for proper instillation. Weatherizing cost can vary based on product / brand, material, items included in kits, product warranty, performance over time and quality of instillation. Most weatherizing products can be done by the homeowner in a minimal amount of time. As always we encourage you to compare products and ask questions so that you get the best product for your specific needs.